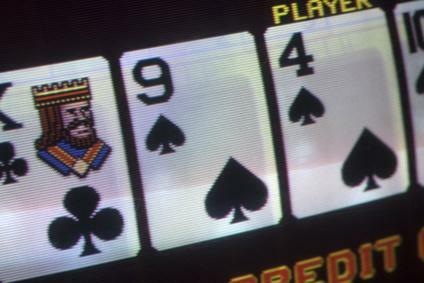 Video Poker has come a long way since it's boom in bars and casinos in the 1980s. The online game is a great example of taking a solid concept, and using technology and imagination to come up with many entertaining variations. You will find a lot of Video Poker content here at High Tech Gambling. Ranging from strategy through to guides to software and individual games. This page is a primer, aimed at readers who are new to Video Poker. If you already know the game and are looking for more advanced topics, there are links to more in-depth articles at the bottom of the page. Video Poker came into reality in the 1970’s when Si Redd, a distributor for the casino giants Bally, pitched his new invention of video poker to the executives of the company. Bally gaming decided against taking up the game, and Si Redd convinced Bally to let him take the patent on the game. He would team up with the Fortune Coin Company in Reno and form a new company called Sircoma (which is an acronym for Si Redd’s Coin Machines). The uptake was a little slow at first; however by 1981 the game started to take off and quickly became one of the most popular games at the casino. This success would lead to many more of the games being produced and casino floors would never look the same again, with video poker machines taking up a great amount of floor space. Sircoma would later change their name to International Game Technology (IGT) – a name familiar to casino enthusiasts worldwide. Video Poker received another huge boost in participation with the advent of online casinos. This game was perhaps the easiest of all casino games to translate to online gaming, as the game offered in live casinos is basically the same as you’ll find online. After the new cards have been dealt, you’ll have your final hand. The strength of the hand will now be compared to the pay chart for the version of Video Poker you are playing, and if good enough you’ll win. At many games you’ll need a ‘Pair of Jacks’ or better to receive a win, however this will become more stringent if ‘Jokers’ or ‘Wild Cards’ are introduced. In the above example we have hit a straight, and this will always feature in the pay chart. If winning, you’ll be offered the chance to ‘double’ at many versions of the game. This is basically a ‘double or nothing’ game, where you’ll see 5 cards, with the card on the left hand side face up. You’ll now have to pick a card from the four face down cards – if your card has a higher value, you’ll double the size of the win, if your card has a lower value, you’ll lose your win and if the card is of the same value, you’ll keep your winning amount. You may be given the opportunity to ‘double’ a number of times on the same hand, meaning you can win 2, 4, 8, 16 or more times your winning amount. There are literally 100's of variations of Video Poker available nowadays. I have listed some of the enduringly popular games below - these are a great place to get started. This is the most popular variation of Video Poker. In this game you’ll be paid out on any hand that is a ‘Pair of Jacks’ or better. In this game you’ll not have Jokers or any wild cards. In this game you’ll be paid out when hitting a pair of tens as well as all other hands. The extra winning hand will be offset by a smaller payout when hitting a Flush or a Full House. A joker is introduced in this game and with it being wild it becomes easier to hit bigger hands. As such, you’ll need a larger minimum hand to win – usually consisting of a pair of Kings. The joker also introduces the potential for hitting ‘5 of a kind’ which is added to the payout chart. You’ll also find a distinction between a ‘Natural Royal Flush’ and a ‘Joker Royal Flush’ – the natural one having the higher payout. In this version of the game, all twos are wild. With four wild cards, your hand range will improve again, and you’ll generally need at least ‘three of a kind’ to claim a winning amount. In this version of the game the chances of hitting ‘4 of a kind’ is just 1 in 15. Like Joker’s Wild, you’ll be able to win with ‘5 of a Kind’ and there is a distinction between a natural and a wild royal flush. Four Deuces will also feature highly on the payout chart. Here is an example payout chart when playing video poker. Each column represents the number of coins you are playing – with the ‘one coin’ payouts on the far left of the chart, and the ‘five coins’ payout on the far right of the chart. The above example is for a game of ‘Jacks or Better’ meaning that you’ll not have an opportunity of hitting ‘five of a kind’ or a ‘wild royal flush’ as you do in other versions of the game. These payout charts can vary from game to game. This is particularly the case in ‘Bonus’ games, where you might find a higher percentage offered for ‘four of a kind’ and other types of specialist games where you might be offered a payout for hitting particular hands, like four Aces. When playing Video poker, the house has an edge. This edge can be minimized if playing a perfect strategy at the game – the strategy involving ‘holding’ the best cards in any given situation. If playing perfectly, the house edge can be worked out. For example, the above payout chart will give players a return of 99.5% when playing 5 coins, or 98.4% when playing four or less (this is due to the massive increase in the Royal Flush winning amount when playing with 5 coins). We look at strategy in the ‘Basic Video Poker Strategy Tips’ and ‘Advanced Video Poker Strategy Tips’ pages. However not all games offer the same payout, and therefore the edge may differ. As you can see from the above payout chart, the Full House and the Flush are worth 9 and 6 respectively (when looking at the one coin payout column). These games are known as 9/6 games. However you may also find 9/5 games (house edge of 98.45% when betting 5 coins), 8/6 games (house edge of 98.39% when betting 5 coins) and even worse versions of the game, so it pays to look around and find the games where the house edge is as low as possible. There is actually one variety of Video Poker where the house edge is in your favour at 100.8%. This is a form of ‘Deuces Wild’ poker played in Nevada. However, it should be added that this edge is only in place when playing the ‘perfect’ strategy which many players won’t. Where to Play Video Poker Online? This does depend on your location.